1994 Alejandro's Gift. San Francisco: Chronicle Books. Lonely in his desert home, Alejandro builds an oasis to attract desert animals and discovers his labors to be a gift to himself as well as to the animals. 1998 Watching Desert Wildlife. Washington D.C.: National Geographic Society. Full page illustrations and text include the roadrunner, Gila monster, snakes, birds, and squirrels. 1998 Cactus Poems. San Diego: Harcourt Brace and Co.
A celebration of odd and awesome aspects of North American deserts. Beautiful photographs illustrate the poems. 1990 Desert Giant: The World of the Saguaro Cactus. Boston: Little, Brown and Company. 1974 Everybody Needs a Rock. New York: Macmillan Publishing Company. Ten rules for finding your own special rock. 1976 Hawk, I'm Your Brother. New York: Macmillan Publishing Company. Rudy adopts a young hawk hoping their kinship will help him learn how to fly. He finally realizes he must free the bird so it can fly with its hawk brothers. 1984 If You Are a Hunter of Fossils. New York: Macmillan Publishing Company. A young fossil enthusiast looks for signs of ancient seas in rocks and imagines how the land looked millions of years ago. 1999 Footprints in the Sand. New York: Scholastic, Inc.
Footprints lead to the homes of Sonoran Desert animals, illustrating that all creatures have a home. 1991 Cactus Hotel. New York: Henry Holt and Company. The saguaro is home for many animals. 1999 Little Critters of the Southwest. Tucson: Southwest Parks and Monuments Association. Baby pictures, brief descriptions and life history of 13 desert animals, emphasize the young. 1999 The Reason for a Flower. New York: Price Stern Sloan Publications. Bright illustrations and a minimum of text tell of the pollination process. Examples are given of many different types of flowers. 1989 Agave Blooms Just Once. Niwot, CO: Roberts Rinehart Publishers. 1990 One Green Mesquite Tree. Niwot, CO: Roberts Rinehart Publishers. 1994 Sonoran Seasons: A Year in the Desert. Niwot, CO: Roberts Rinehart Publishers. 1992 The Three Little Javelinas. Flagstaff: Rising Moon. The old tale of the three little pigs is retold with the pigs being replaced by javelinas. 1994 The Tortoise and the Jackrabbit. Flagstaff: Rising Moon. The old tale of the tortoise and the rabbit is retold with desert critters. 1998 Way Out in the Desert. Flagstaff: Rising Moon. 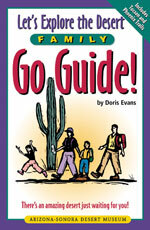 This is the Sonoran Desert version of "Over in the Meadow..."
2000 A Kid's Guide to Exploring Saguaro National Park. Tucson: Southwest Parks and Monuments Association. An attractive 8 page booklet gives brief explanations about the common plants, animals, and other features of the Park. 1997 Sing Down the Rain. Santa Fe: Kiva Publishing Company. Written as a poem with illustrations by Tohono O'odham artist, Michael Chiago, tell of the annual summer ceremony. Wine is made from saguaro fruit and all dance in a circle to ask for plentiful rain. 1995 Creatures of the Desert World. Washington D.C.: National Geographic Society. Pop-up book full of Sonoran Desert plants and animals. 1996 Desert Buddies. Tucson: Earth Buddies. Simple text and delightful line drawings by Nancy Lenches Alegret introduce children to desert life. Children may color in the pictures. 1999 Don't Call Me Pig: A Javelina Story. Tempe, AZ: Resort Gifts Unlimited. Rhymes and colorful illustrations explain why the javelina is not a pig. 1995 Coyotes in the Crosswalk. Stillwater, MN: Voyageur Press, Inc. True tales of animal life in the wilds of the city and how many wild animals have adapted to city life. 1996 A Desert Scrapbook: Dawn to Dusk in the Sonoran Desert. New York: Simon and Schuster. The artist/author paints and writes about her desert backyard. 1997 Cactus Cafe. Norwalk, CT: Trudy Corporation. The saguaro cactus as an important food and nesting site for many desert animals.